These tracks were made on Mars by the rover Curiosity, during its longest drive yet on Sol 29, its 29th day on Mars, Sept. 5. NASA's new Mars rover Curiosity is going strong on the Red Planet, and made its longest drive yet Tuesday (Sept. 4), during the 29th day of its two-year mission. During the long drive, the car-size rover drove 100 feet (30.5 meters), traveling southeastward inside Mars' Gale Crater. At one point, the robot moved to avoid some potentially troublesome sand, mission managers said in an update. Overall, the Mars rover Curiosity has now covered 358 feet (109 meters) of Martian terrain. Curiosity, the centerpiece of the $2.5 billion Mars Science Laboratory mission, landed on Mars Aug. 5 (PDT) to search for clues about the Red Planet's past habitability. The rover is carrying 10 different science instruments and 17 cameras. "The Mars Science Laboratory spacecraft is one month into a two-year mission to investigate whether conditions have been favorable for microbial life and preserving clues in the rocks about possible past life," NASA officials wrote in a statement. Since its Aug. 5 landing, Curiosity has been steadily testing out its instruments and turning its wheels. The rover traveled 98 feet (30 meters) during the mission's Sol 26, on Sept. 1, and also conducted an empty-cell test analysis with its Chemistry and Mineralogy (CheMin) instrument. 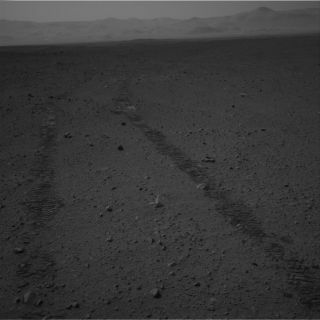 That day's drive allowed mission controllers to test its "visual odometry" system, which uses imprints on Curiosity's wheels to make indentations in dirt, visible in the rover's photos, that allow scientists to track the distance traveled by the rover. From Sol 27 to Sol 28 (Sept. 2 to Sept. 3), Curiosity analyzed a sample of Martian atmosphere using the Sample Analysis at Mars instrument (SAM). This device can detect the presence of light elements such as carbon, hydrogen, oxygen, and nitrogen, which might be associated with life. "Curiosity continues to work in good health," officials wrote. Mission managers plan to give an update on the rover's progress during a press conference held at NASA's Jet Propulsion Laboratory in Pasadena, Calif., home to Curiosity's Mission Control, today (Sept. 6) at 10 a.m. PDT (1 p.m. EDT). You can follow the NASA press teleconference live here: http://www.nasa.gov/newsaudio. Visuals from the briefing will be available here: www.ustream.tv/nasajpl.